If you’ve ever been in the meat aisle of the grocery store getting ready for a party and trying to figure out how much chuck you need to make burgers, but then decided, “Nah, this is too hard, we’ll just do hot dogs,” then this post is for you. Grilling hot dogs is an American pastime for everyone, including your annoying paleo-lifestyle friend, and even Guy Fieri. Hot dogs are the great equalizer. They are for everyone. First you’ll need to get some of those diggity dogs. Presumably, you’re not grilling at Diddy’s White Party, or even at a place that requires you to wear pants or shoes to get in. We’ll assume you’ll be in your backyard or nearest public park or lake-front real estate ... so feel free to use cheap garbage hot dogs. In the end, it’s all the same, and once you’ve given up and made the decision to eat a hot dog, you’re not really in a position to get fancy. I usually buy Hebrew National or Nathan’s Famous because they seem reliable enough. Ever had someone come to your party and ask you what brand of hot dogs you’re grilling? No, you haven’t! Because that doesn’t happen. Next of course, you need to fire up the grill. And I do mean a real charcoal grill, because grilling hot dogs is great and should be done the right way. If you do ‘em well, you end up with a delicious tube of processed meat that has just the right kinda crispness on the outside. Sometimes eating terrible food feels so good. So pop your meat pups on the grill, and leave them there until you see detectable grill lines and they look right. I know this might sound terrible, but the time-based equivalent of the eyeball test is usually about five minutes. If you’re not sure it’s ready, poke the little meat stick with a fork to test for done-ness. It’s not rocket science. And it’s not anything that will land you on Chopped anytime soon. This is about being adequate, and I’d say the process above was at least adequate. Finally: Top your hot dogs how you dog damn please because this is America, and it’s her birthday. If you ask me, the more dressing on your dog, the better: ketchup, mustard, hot mustard, relish, yellow onions, red onions, grilled onions, cheese, jalapeños, cilantro, avocado, pineapple, bacon, ham, chili, peppers, really anything. Potato chips! Get creative, but most of all, do what you feel. If you’re just a ketchup guy, you’re just a ketchup guy, and we love you the way you are. 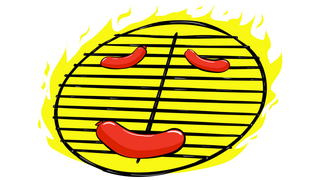 Why hot dogs on the Fourth of July? Something about them is so American in that they’re a pretty lowbrow fare, and yet you can still find places in New York that make hot dogs into Asian fusion and sell them for $9 each. The hot dog knows no bounds, sort of like American exceptionalism. Think of eating one this July 4 as a patriotic act.